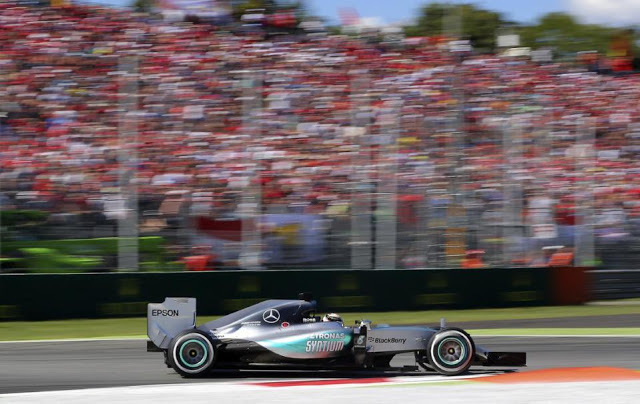 Lewis Hamilton was unstoppable at the Italian GP last Sunday…but for a few hours after he took the checkered flag, his victory was at risk of being revoked as there was an inquiry into the pressure of his rear tyre, which was 0.3 psi below the 19.5 minimum. Meanwhile, the Mercedes driver was interviewed on the podium by none other than George Lucas, the famed creator of Star Wars. Hamilton already had a comfortable lead and had wanted to turn his engine down, so he was perplexed at the terse instruction. “The last few laps I was told to push and I’m thinking, ‘I’ve got quite a big gap already.’ So I was a little taken aback by it. But nonetheless I still managed to pull it out and do what they asked me to do,” he said. As Hamilton cruised to his seventh win of the season, his teammate Nico Rosberg’s engine caught fire with only two laps remaining, forcing him to retire, and Hamilton’s championship title’s lead stretched to 53 points ahead. Ferrari’s Kimi Raikkonen started from the front row of the grid, where he hasn’t been familiar with since China in 2013, but his car stalled at the start, leaving his teammate, Sebatisan Vettel, to battle it out on his own to second place. Felipe Massa made it narrowly to third, edging out his Williams teammate, Valtteri Bottas.